Geez Rei. Get some chill. But I’m going to repeat what I was saying over there earlier this week. I don’t talk about my day job much on the comic site but if you follow my tumblr you probably know it’s getting to the point where I need to quit for my own mental and emotional health. I really want to make comics full time instead. 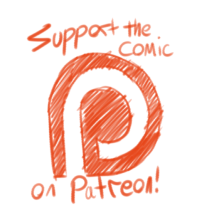 If you would like to help me out please consider backing the comic on Patreon. If you’d like to help but can’t afford to pay actual money you can still help by making sure you have adblock turned off when you’re on my site and sharing the comic with friends. If I can get to the point where I don’t need the day job I’ll be able to make a lot more content for you all and be able to make more convention appearances in the future. Rei, babe, while I ship you and Milosh like nobody's business, doing the nasty as repayment is not okay. You tell him Milosh! Tell him and shower him in platonic bromate affection! Milosh is straight dude. Course he'd say no even if he wasn't cause he's a gentleman too. Poor guy doesn't know what else to do. Hey, I just wanted to say that I really love this comic. I am reading Worst Idea as well, but these two are my favorite characters in that one, so naturally, I am in love with this. I love your style, and your thorough exploration of your characters' personalities and motives. Also, Gabry and Liam are just plan adorable! Give Rei, the cuddles he needs the cuddles.